Almost any data center housing IT equipment validated to work in hotter-than-standard temperatures can use free cooling all year long, according to new “free cooling maps” released this week by The Green Grid. The data center industry organization updated its cooling maps to take into account new allowable inlet air temperature and humidity envelopes by the American Society of Heating, Refrigeration and Air conditioning Engineers (ASHRAE). This equipment must be validated to operate as normal even if inlet-air temperature in the data center spikes up to 40C for short periods of time. 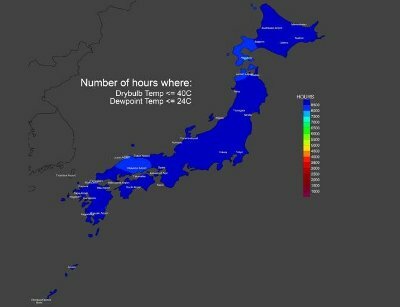 “If operators have equipment that can run in the new class A3 Allowable range, that is, up to 40C for short periods of time, then the maps indicate that in 91% to 99% of locations, free air cooling could be used every hour of the year, even in Japan,” The Green Grid’s report on the map update read. Data centers supporting equipment in the previously existing ASHRAE classes could fully cool that equipment using fresh in 75% on North America, 97% of Europe and only 14% of Japan. ASHRAE expended its range of allowable temperature and humidity for certain types of IT equipment last year. In doing so, the society aimed to encourage more use of free cooling by data centers, ultimately reducing the amount of energy data centers consume. Yet, far from all IT OEMs have validated products to work within the new guidelines. Dell was the first major OEM to act, validating an entire line of data center gear, including servers, storage and networking equipment, to work in hotter conditions. The company called this product line Fresh Air. The Green Grid surveyed a group of data center operators to find out how beneficial the use of air-side economization really was. The participants reported that an average of 20% of the money, energy and carbon emissions could be saved with an airside economizer. The updated free-cooling maps were part of a slate of new materials The Green Grid released at its annual forum in the Silicon Valley this week. The industry group also launched an online course for server power management, released its analysis of key energy policy affecting data centers in EMEA, launched a tool for assessing data centers against its Data Center Maturity Model (DCMM), and released two reports on data center energy efficiency in Japan.